Bob’s birthday is the 16th of June, this Tuesday. Our godchildren’s father’s birthday is the day before. Most of you know Clint. He’s generally a good guy. Sometimes he is delusional and thinks he is my son. This amuses him…it pisses me off (not really *wink*). It’s a game we play…because anyone who knows me knows that I am far too young to have a son Clint’s age! Truth of the matter is, I would be proud to have Clint as my son. His heart is true and good. But I swear, if any of you tell him I said that I will totally deny it! Anyway, he loves key lime pie. And he requested a key lime pie for his birthday. 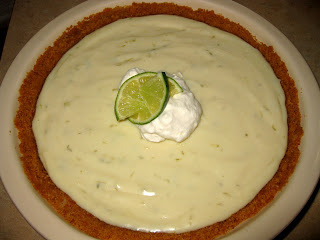 If you’ve ever made a key lime pie then you know what a pain in the tush it is to make. But he knows darn good and well that if he asks me to make something especially for him, it is as good as done. 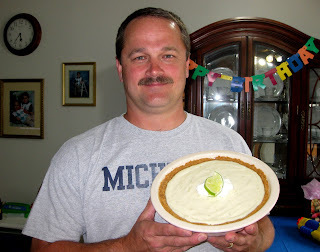 I went in search of a good key lime pie recipe. I couldn’t find the one I used last year for his birthday. I turned to my tried and true favorite recipe site, http://www.allrecipes.com/. I found a recipe that had over 200 reviews, five out of five stars, and although I didn’t read all 200+ reviews I didn’t see a single negative one. I decided to go for it. The only way I changed the recipe was to add a little extra zest and a little extra juice. I did this because I couldn’t find fresh key limes. Since I was using regular limes, I wanted to tart it up a bit…‘cause that’s just the kind of girl I am! As I was assembling the pie, I couldn’t stop tasting the filling. It tasted so good before I even baked it that I simply couldn’t wait to dig in. But alas, it was for Clint after all. So I had to wait. After we had partially recovered from the food coma that we were in after dinner (and what a dinner! ), the boys (Bob & Clint) opened their gifts. And after the appropriate amount of appreciative sounds from both of them we decided it was time for pie. Bob had baked an absolutely gorgeous cherry pie as well. Time for the moment of truth…drum roll please…Wow. Actually I mean…WOW!!! It rocked! And it was so easy it’s almost embarrassing! Clint loved it (that is unless he was lying to me). Virna loved it, and Bob agreed with both of them. Success! It was really good. And so easy. A home run! I’ll be happy to make this key lime pie for Clint anytime. 3. Bake in a preheated oven for 5 to 8 minutes, until tiny pinhole bubbles burst on the surface of pie. DO NOT BROWN! Chill pie thoroughly before serving. Garnish with lime slices and whipped cream if desired.